Top 7 Most Romantic Places in Tokyo! Hello guys, how is it going? I hope you are all fine since today I’m going to cover about the romantic places in Tokyo. One of the most essential things that the lover seek is a romantic place to spend their time, isn’t it? In my opinion, Tokyo is one of the cities in this world that has the most romantic places. Though the style of the romantic is quite different with what will you get in other cities like Paris, Tokyo has its own characteristic of romance. From a romantic park to a romantic restaurant in a high building, Tokyo has it all. Not to mention the magnificent views surrounding the area and the great atmosphere in those places, certainly those are something that you can only find in no other city but Tokyo! Now, let’s see what are those romantic places that Tokyo has to offer..
One of the well-known landmark of the metropolitan city Tokyo is no other than the Tokyo Tower. Though recently this tower has been rivaled by a new higher tower, which is Tokyo Sky Tree, this communication and observation tower that was built in 1958 hasn’t lost its own charm. Located in Shiba Park, Minato, Tokyo, this tower still has lots of visitors who come regularly to enjoy the magnificent view of the Tower and the glittering neighbourhood surrounding this red tower in the night-time. Inside this 333 metre high tower you will be enchanted by the pack of the giant structures around it. There is also a lounge inside this tower for those who want to spend their time by relaxing and having some drinks while enjoying the night view of busy Tokyo with your partner. On the other hand, you can also enjoy the magnify of this red shinning tower itself at night from outside since there are lots of parks that are located around the Tokyo Tower. 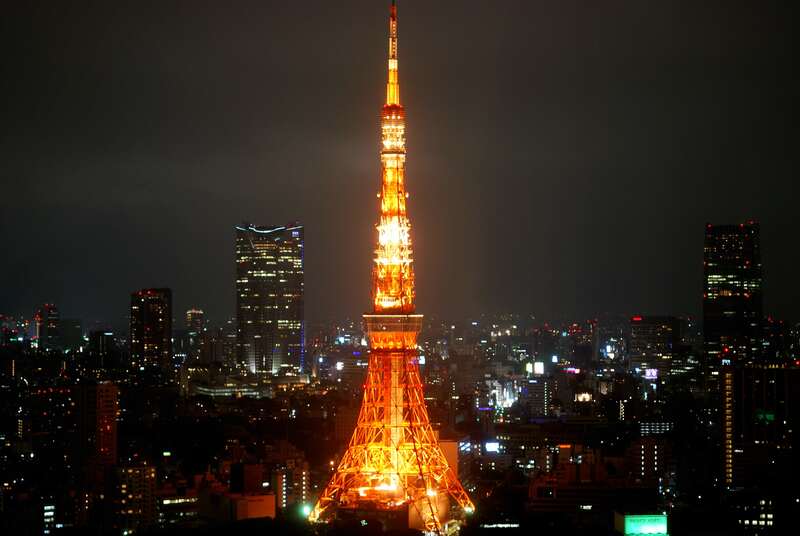 It is believed by the lovers in Tokyo that the couple who watch the Tokyo Tower as its lights being switched off will always be together and happily ever after. Some of you who love to read manga or watch anime maybe are familiar with this observation deck since this place often appear in the anime or manga. For those who want to enjoy the night of metropolitan of Tokyo at an outdoor place then this Sunshine 60 Observation Deck suits you well. The Sunshine 60 Observation Deck is located at the top of Sunshine 60 building which is a part of Sunshine City, the oldest city within a city in Tokyo. The complex that was opened in 1978 is located in Ikebukuro, which is one of the biggest entertainment and commercial district in Tokyo. With the help of the little lights on the fence and on the floor and the breeze that is blowing as you watch the glowing night view of Tokyo from above make the Sunshine 60 Observation Deck become one of the most romantic place in Tokyo. A cafe that has a great view with a reasonable price? Is that kind of place possibly exists in the downtown of Tokyo? 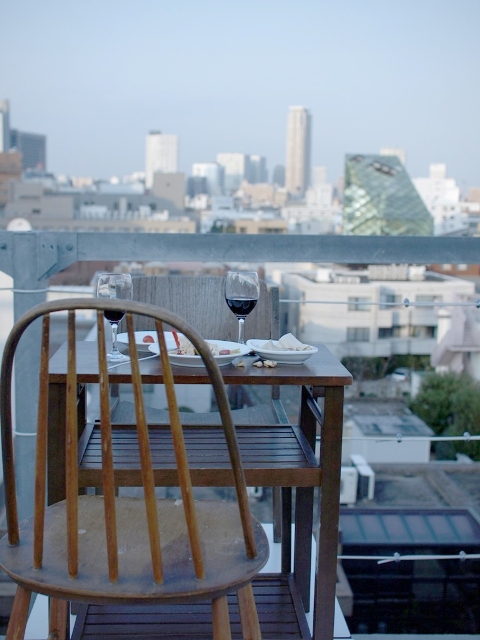 Yes, you can find that place located at the top of a building in Aoyama area. A joint project between a celebrity artist Yoshitomo Nara with Graf Design Collective makes one of one best chill-out places in Tokyo, A to Z Cafe. Though the interior design of the cafe is unique and interesting, the roof top bar is still a better choice for those who seek for the romance. Accompanied with a reasonable price, but terrific foods and drinks will always make you want to go back to spend time in this place. With the view that face straightly to the downtown of Aoyama, where the distinct Dior Aoyama flagship store is also located, there is no question that A to Z cafe is one of the best place to spend either in the afternoon or evening with your partner in Tokyo. Have you ever dreamed to spend a romantic night with your lover in a magical land of Disney? You can make your dream happen in this Disney Sea. 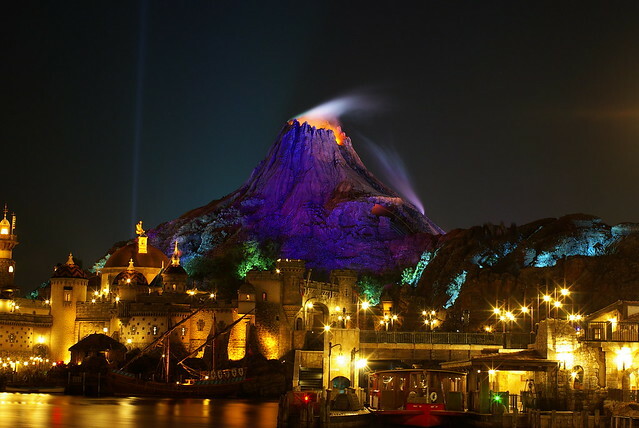 There is no doubt that Tokyo Disney Sea is one of the best and the biggest theme park in the world. Aside from the great attractions that could make your heart pop out from your body, the night atmosphere of this Disney city is what the lovers look for. Thousands of lights that shine the cities with each own theme inside this theme park combined with the great landscape that no other theme park could compete is going to make you magical romantic night into reality. Another romantic place that you can go to without a pack of money is located in Decks Tokyo Beach. From the fashionable beach-side Decks Tokyo Beach’s boardwalk, you can watch the colourful lights of the fabulous Tokyo Rainbow Bridge at night. The Rainbow Bridge itself is a giant suspension bridge connecting the main Tokyo area to the artificial island, Odaiba. 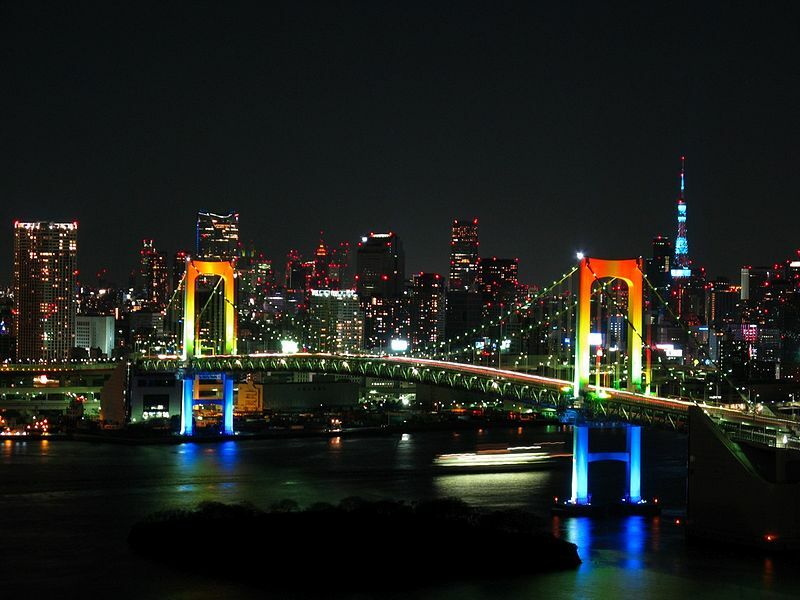 The shinning lights of the Rainbow Bridge at night with the view of the areas surrounding the bridge such as Tokyo Bay and the other glowing buildings on the background is one of the best spots in Tokyo to spend a quality time with your beloved one. Ebisu Garden that is located in Ebisu is one of the best and the most romantic parks in Tokyo to spend your time with your partner at night. Located inside a complex that houses a department store, restaurants, hotels, and museum, this place is another free romantic place to go. The classic design of the buildings that makes those buildings look like castles in this place is also another attraction for couples to come. At night, the cool breeze that is blowing at this wide park with the light illuminations that shines on the tree and on the castles make this Ebisu Garden Place a worthy place to stop by for lovers. Finally, the new ultimate romantic place Tokyo has to offer is the La Sora Seed Food Relation Restaurant. Located on the 31st floor of Tokyo Solamachi, this La Sora Seed Food Relation Restaurant is a luxury place to have some great foods and drinks right beside the highest tower in the world. 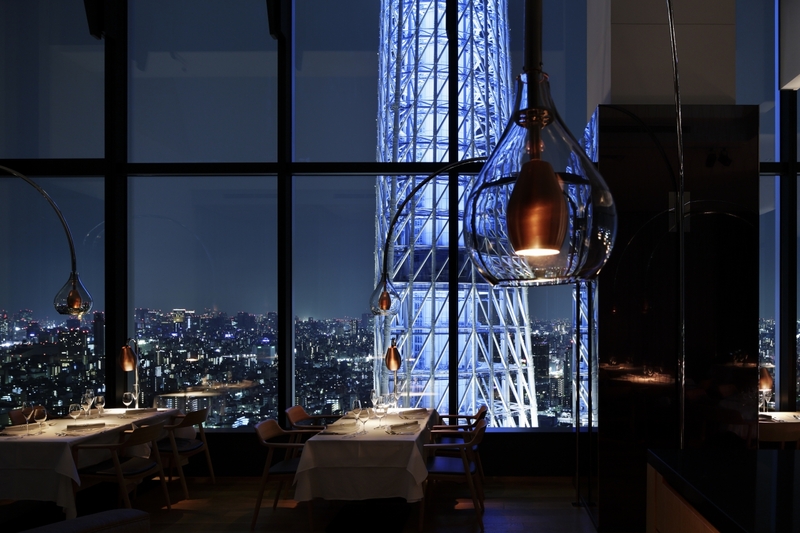 This restaurant is best to be visited at night-time as the buildings surrounding the place turn on their light, including the Tokyo Sky Tree as well. The lovely decorations, exclusive atmosphere, with the spectacular night view of Tokyo behind the Tokyo Sky Tree make this place become one of the newest romantic restaurant to have a great dinner with your partner. Such beautiful photos wow they are truly amazing!